Sierra Shepard is the perfect seventh-grader, but she never expects an accident--bringing her mother's lunch, which includes a knife, to school--to land her in in-school suspension. 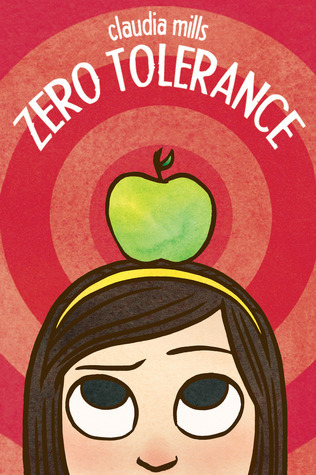 Thanks to her school's ironclad zero-tolerance policy regarding drugs and weapons, Sierra must spend her days with other troublemakers, including classmate Luke, until her expulsion hearing, which even her attorney father may not be able to win. Ohhhh dear. I love the font, especially since it looks almost hand-lettered, and the way the author's name is lowercase and the title is in all uppercase. However, the illustration is simple--too simple, and it really doesn't evoke anything of the story or its style. Disappointing. I received this ARC before the pub date, obviously, and I let it fall by the wayside--something I regret immensely now, because holy freaking goodness this book is good. Claudia Mills absolutely nails the voice. Sierra is a perfect student, yes but she's also eminently relatable and simply wonderful to read about. Her third-person point-of-view never feels distanced; it almost feels like a first-person narration, which in itself should be an excellent indicator of how well-developed Sierra is. For the second time that morning, Sierra's eyes stung with tears. Luke looked up from whatever he was killing and dismembering in his game. "I didn't get to fire my pot today," Sierra told him. Luke shook his head as if to clear some obstruction from his ears that was keeping him from hearing her properly. "You smoke pot?" "Not that kind of pot! The clay pot I was making in art class. Today was the day it was supposed to go to the kiln to be fired." Luke still looked puzzled. "And you're crying about it?" Sierra nodded. "I loved my pot." "You loved your pot," Luke repeated. "Okay." "You don't love anything about school, do you?" Not that it was any of her business, but if she wasn't going to be trying to keep up with her schoolwork anymore, what else was there to do except make herself sad over her poor, orphaned pot or talk to Luke Bishop? "Can't say that I do." "Did you ever? Like in kindergarten? Did you like being in the Pilgrim play at Thanksgiving? Or making a cast of your hand in plaster of paris to give to your parents at Christmas?" "I liked one day," Luke said. "It was called Backwards Day. We put our clothes on backwards, and zipped up our coats in the back. And the whole day went in backwards order. We started with resting time instead of ending with resting time, and we ended with the Pledge of Allegiance instead of starting with it. I thought it was totally cool, Backwards Day." "So what happened after that? To make you stop liking school?" His expression had changed from scornful anger to something that looked like hope. Hope that she'd look at him the way he had seen her look at Colin [her former crush]? Impulsively she hugged him, even though she didn't want to give him the wrong idea, the idea that she liked him, as in liked him liked him. Ethnic balance: 1.5 out of 5. Lots of white-sounding first and last names, with only one kid in suspension with a "dark complexion".